The basic structure of information representation in social and scientific applications is the topic of this course. Organization, storage and retrieval of information are important challenges for the modern information society. This course introduces representational structures and approaches from many disciplines: philosophical theories of classification and categorization; psycho-linguistic models of mental language processing; information access and representation on the World Wide Web; object-oriented design and relational databases; AI knowledge representation and discovery. The multi-disciplinary approach of this course demonstrates how concepts of information representation are shared amongst different disciplines and how they can be combined. The goal of the course is to provide a broad but basic introduction to current information representation techniques and paradigms. Although some software tools will be used in the exercises, the students are not expected to write computer programs for this course. Even concepts such as object-oriented design will be explained independently of an actual programming language. To introduce the student to a broad range of information representation models drawn from the fields of information science, computer science, semiotics, philosophy, cognitive psychology, and artificial intelligence. Basic computer literacy. Students must be able to use a word processor and to read documents on the WWW. Each class session consists of lectures, class discussions, and in-class exercises, which the students will work on in small teams. Besides the in-class exercises, assignments are given for each week that the students should work on (with the help of the assigned readings) before the weekly meetings. The students will keep a journal to collect their assignments and comments to the assigned readings. Students are strongly encouraged to participate actively in all lectures and discussions since each student's participation in class activities will constitute 1/4 of his/her final grade. A readings package will be put on reserve in the SLIS library. (Further details concerning the package will be given in the first lecture.) Many readings are on-line available and are linked to this syllabus. To read the on-line ACM readings, students must use a computer that belongs to the indiana.edu domain because the ACM digital library may not be available otherwise. Minor changes in the selection of readings are possible up to two weeks before the assigned week. Each student is expected to complete all course work by the end of the term. A grade of incomplete (I) will be assigned only if exceptional circumstances warrant. In all other cases there will be a grade penalty for items that are handed in late. Class contribution means more than simple attendance, it also includes the quality and quantity of contributions to the work of the class. The assignments and readings of each week should be completed before the class meeting (except for the first week) so that substantive and meaningful contributions from the students are possible. It is required that every student demonstrates respect for the ideas, opinions, and feelings of all other members of the class. A majordomo distribution list will be used to communicate about course matters. The students should send comments and questions concerning the reading materials to this list. Participation in the listserv discussions will be counted towards class participation, i.e. students who do not like to speak up in class can contribute their ideas via the listserv. The distribution list is upriss_q200@indiana.edu. Students are required to keep a journal for this class. The journal must at least contain a comment, abstract, or short discussion of each required reading and the weekly assignments. The journals will be turned in three times during the semester (after week 5, 10 and 15). At each review, a letter grade will be assigned based on the completeness of the journal and based on evidence of active intellectual involvement with the subject content of the course. The final journal grade will be computed as an average of the three review grades. The journals can be handwritten but a spell-checked, computer-printed format is preferred. Both exams will be take-home exams. The midterm exam will contain 1 to 2 essay questions and may contain a multiple-choice part. The final exam will contain 2 to 3 essay questions. The students must clearly indicate if they use materials from other sources, such as textbooks or Internet webpages. Full citation information must be given for such sources. Academic and personal misconduct by students in this class are defined and dealt with according to the procedures in the Code of Student Ethics. What is data? Information? Knowledge? How are they represented? (Write a short essay.) Analyze the methods of information representation and information access in a phone-book. Pay special attention to the yellow pages. How are they organized? Which possibilities of information retrieval offers a phone-book on CD-ROM compared to a printed phone-book? What are equivalent services on the WWW? What are the user expectations of these types of information systems? The Understanding Business. In: Information Anxiety - What to do when information doesn't tell you what you need to know. New York: Doubleday. p. 51-82. Information as thing. Journal of the American Society for Information Science, 42, p. 351-360. What is categorization or classification? * whether this organizational/categorization scheme actually helps or hinders the customer in finding specific items. Classification and categorization: drawing the line. In: Barbara H. Kwasnik and Raya Fidel (Eds.). Advances in classification research. Vol. 2, Washington D.C.: American Society for Information Science, p. 67-83. Optional Reading: Zerubavel, Eviatar (1991). Chapters 1, 2, and 4 of The fine line: making distinctions in everyday life. Chicago: University of Chicago Press, p. 5-32 and 61-80. Design a script for "shopping in a grocery store". How universal can your script be (considering shoppers with different cultural backgrounds or grocery stores in different countries)? The role of knowledge in software development. Communications of the ACM, January 1999, p. 87-92. Optional Reading: Rumelhart, David E. (1984). Schemata and the cognitive system. In: Wyer and Srull (Eds.). Handbook of social cognition. Vol. 1, Hillsdale NJ: Lawrence Erlbaum, p. 161-188. Optional Reading: Schank, Roger, and Kass, Alex. (1988). Knowledge representation in people and machines. In: Umberto Eco, Marco Santambrogio and Patrizia Violi (Eds. ), Meaning and mental representation. Bloomington: Indiana University Press, p. 181-200. Three facets for grocery items are "storage temperature", "packaging", "type of meal". Find some values (classes) for each of these facets. Choose five grocery items and assign them to classes in the facets. Faceted Classification. Classification made simple, Gower, p. 7-33. Describe the use of tools such as "knife", "fork", and "cup" during the process of "eating a meal" in a semi-formal way. It will be composed of actions, such as "picking up fork", "holding fork", "laying down fork", etc. What are the temporal relationships, i.e. which actions precede or follow which other actions, which actions are simultaneously? You can use a graphical representation similar to Figure 2. in Allen's paper. How can you represent repeating actions? Temporal Reasoning and Planning. In: Allen et al. (eds.). Reasoning About Plans. Kaufmann, San Mateo, CA, p. 2-22. * three terms that would be useful for retrieving the document through a full text search but that would not be listed as subject terms or index terms. Information Retrieval on the World Wide Web. IEEE Internet Computing, October 1997. Web Search Engines. Journal of the American Society for Information Science, 49 (11), p. 973-982. Design a simple system for traffic simulation that contains cars, bikes, pedestrians, streets, pedestrian crossings, traffic lights and crossings with four-way stop signs. For each class give several attributes and methods. Pay special attention to attributes that are needed so that the vehicles and pedestrians can react to crossings and to other vehicles and pedestrians. Parsons, Jeffrey; Wand, Yair (1997). Choosing classes in conceptual modeling. Communications of the ACM, June 1997, p. 63-69. (Online document). This reading is also relevant for the next week. Optional Reading: Kiczales, Gregor et al. (1997). Aspect-Oriented Programming. In: Proc. of the Europ. Conf. on Obj.-Oriented Progr., Springer Verlag. (Skip section 5 and 6). Draw entity-relationship diagrams for the traffic assignment. Data Modeling. Danvers, Boston: Boyd & Frasier, p.17-38. Unifying Heterogeneous Information Models. Communications of the ACM, May 1998, p. 37-44. Analyze the following semantic network. 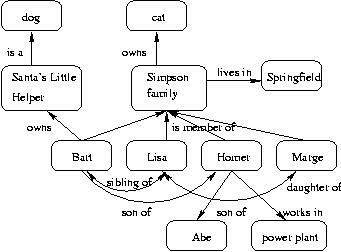 What implications are made by the network: what statements can be made about the relationship between a) "Marge" and "dog", b) "Lisa" and "power plant" and c) "Marge" and "Springfield"? Which information is missing? Knowledge Representation in AI. Artificial Intelligence. Chapter 9. Boston: Boyd & Frasier. p. 274-299. Compare the term (concept) "clothes" in the CYC Upper Ontology, WordNet and Roget's Thesaurus. WordNet: a lexical database for English. In: Communications of the ACM 38 (11), November 1995, p. 39-41. CYC: a large-scale investment in knowledge infrastructure. In: Communications of the ACM 38 (11), November 1995, p. 33-38. (Click on "Use WordNet Online"). Marry buys an apple at the large grocery store for $1.00. The plane flies from Chicago to Indianapolis. John believes that the plane that arrived from Chicago will leave on time. Conceptual Graphs and Conceptual Graphs Examples (on-line documents). A first Course in Formal Concept Analysis. Proceedings SoftStat'93. Gustav Fischer Verlag. p. 1-5. Conceptual Landscapes of Knowledge: A Pragmatic Paradigm for Knowledge Processing. Proceedings of KRUSE'97, p. 2-13. Vogt, Frank; Wille, Rudolf (1995). TOSCANA - A Graphical Tool for Analyzing and Exploring Data. In: R.Tamassia, I.G. Tollis (eds. ): Graph Drawing. LNCS 894. Springer, Berlin-Heidelberg, 226-233. Data Mining and Knowledge Discovery in Databases. Communications of the ACM, Vol. 39, No. 11, p. 24-26. Knowledge Discovery. Communications of the ACM, Vol. 42, No. 11, p. 27-29. Communications of the ACM, Vol. 39, No. 11, p. 27-64. Communications of the ACM, Vol. 42, No. 11, p. 30-67.